It remains unclear where the Italy international will play his football this season after the Süper Lig side ruled out a move. Mario Balotelli is out of favour at Liverpool. BESIKTAS COACH SENOL Gunes has no interest in signing Mario Balotelli despite reports linking the Liverpool forward with a move. The Turkish giants surprisingly emerged as a potential home for the 25-year-old, who has been deemed surplus to requirements at Anfield. 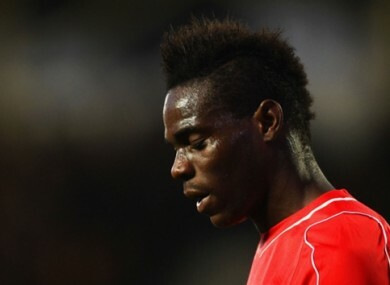 Besiktas chairman Fikret Orman said he wanted Balotelli and that the 33-time Italy international was keen to join. However, Gunes shut down those suggestions, saying he had no desire to bring the former AC Milan and Manchester City forward to the club. “There were also rumours about Aleksandar Kolarov but he wasn’t in my plans,” he said on Saturday. Balotelli, who scored three goals in 23 games on loan at AC Milan last season, has also been linked to Ajax. Email “Mario Balotelli unwanted by Besiktas coach”. Feedback on “Mario Balotelli unwanted by Besiktas coach”.